Make masonry an integral part of your property’s design. Whether you’ve made the decision to add a natural stone veneer to a preexisting structure, or you’re looking to build something from the ground up, masonry can give your home a classic appearance. But masonry isn’t always clear-cut – brick-and-mortar constructed from concrete or clay can evoke everything from the architectural wonder of the Colosseum, to the dour plainness of a New York City tenement building. Suffice it to say that design is just as important as the material used. So, how can you take advantage of the low-maintenance, fire-resistant properties of masonry while enhancing the look of your home? Read on to discover what you need to consider before throwing your hat into the ring. 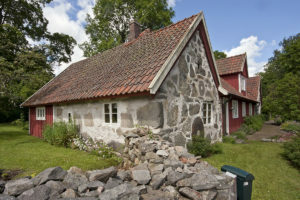 I love the look of masonry…but I already have a stick-frame house. Not a problem! Adding natural or artificial stone to your home’s exterior is a great way to raise property value while accentuating your favorite aspects of a home’s design. You’ll also get the added benefit of durability in the face of oscillation (a force that appears during an earthquake or extreme winds), which is the “Achilles heel” of masonry architecture. Brick or stone veneers can be applied to concrete blocks, poured concrete, and other unsealed, preinstalled masonry. If you have a wood surface, you’ll need to nail double D paper to the wood to create a vapor barrier. After preparing the wall, mortar can be applied. Even if you’re an avid DIY-er, we recommend having professionals (like Cirigliano Natural Stone & Masonry) perform the installation, since masonry is more of an art than an exact science. How else can I incorporate masonry design into my home? Try stone walls instead of white picket fences. Building with natural stone means that no two stones are alike. So, if you want to break out of the cookie-cutter format of tract housing, start with a visually complex façade in the front of your home. Natural stone walls are where rustic elegance meets modern chic. Couple them with a fountain or garden, and you’ll be stunning your neighbors in no time. Why not add a stone or brick walkway to match those walls? Wood walkways look great and all, but with the amount of maintenance you’d go through to keep that finish and sealer intact in rain, sleet, and snow, you might as well outfit your front porch in stone. Masonry is known for standing up to inclement weather (think about how many ancient structures are still standing today), and isn’t subject to cracking like a standard, poured-concrete pathway. First impressions count, and if there’s even the faintest possibility that you may sell your home or property one day, a stone walkway is an attention grabber. You may not judge a book by its cover, so to speak; but you can bet potential homebuyers will write-off purchasing a property just by its curbside appeal. Chimneys and fireplaces look better with mortar. You may already have this checked off on your itinerary; for a large percentage of homes built in the latter half of the twentieth century, this is the only part of the house that features brick or stone constituents. Yet, many contemporary homes are eschewing tradition in favor of mantels and cladding of solid marble, wood, and artificial stone. Whatever material your fireplace has currently, upgrading the buildout will give your living or dining room a little bit of that pastoral élan which older cottages have. It’s also an excellent way to accentuate the colors of your mantel and hearth. Patios and masonry go together like peas in a pod. Entertaining guests? Or maybe you just want to spend a relaxing time outdoors with the whole family? Paver stones, made of a cement-based aggregate, can add a European sophistication to an afternoon barbeque. They’re easy to clean with a hose and make a natural gathering place for adults when children play on the grass of your backyard. Specializing in extensive masonry repair and rejuvenation, Cirigliano Masonry serves home and business owners throughout the Pittsburgh area. From design to build, as well as complete restoration options, rely on us for brick masonry, pointing and repair. We also offer general masonry, stone repair, and more.